48 www.coalage.com July/August 2018 legally speaking Legal Environment, Business Opportunities for Unmanned Aircraft in Coal Mining by erik dullea & christian rice Financial forecasts predict the global Unmanned Aircraft Systems (UAS or drone) market will be worth more than $120 billion in 2020, up from $2 billion in 2016. 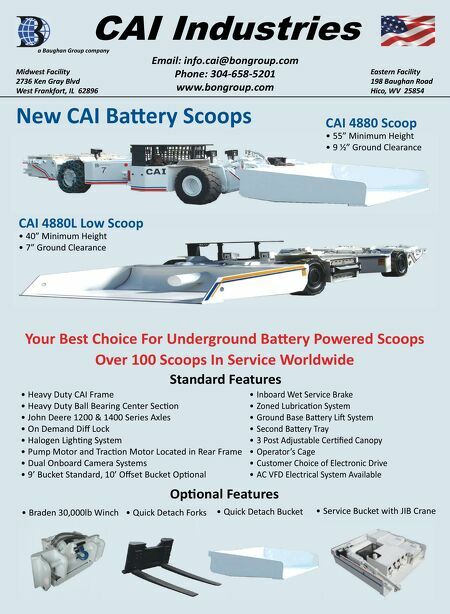 The mining industry is taking advantage of these newly affordable de- vices to make operations safer, more ac- curate and more cost-effective. However, this industry is not without regulatory compliance challenges, including em- ployee safety and privacy protections. The Federal Aviation Administra- tion (FAA) regulations apply to drones operating on and above the surface, and mine operators flying a UAS above their surface facilities must be aware of their responsibilities under the FAA reg- ulations — even if the UAS flights occur over the mine's private property. There are two areas the FAA does not regulate: (1) underground flight operations and (2) operations inside of buildings. While the FAA has been at the front of the regulatory effort, it will not be the only agency to regulate unmanned air- craft operations. The FAA already has a memorandum of understanding with the Occupational Safety and Health Ad- ministration (OSHA) that apportions jurisdiction within passenger airliners, allowing OSHA to enforce safe working conditions within airplane cabins. The Mine Safety and Health Administration (MSHA) has jurisdiction over the safe- ty and health conditions on boats and ships where miners work, even though the Coast Guard has regulations appli- cable to the vessels themselves. On June 18, the D.C. Circuit Court of Appeals dismissed a lawsuit challenging the FAA's decision not to publish regula- tions protecting privacy rights. Prior to, and during the lawsuit, the FAA said it does not regulate privacy, but is focused on airspace safety. 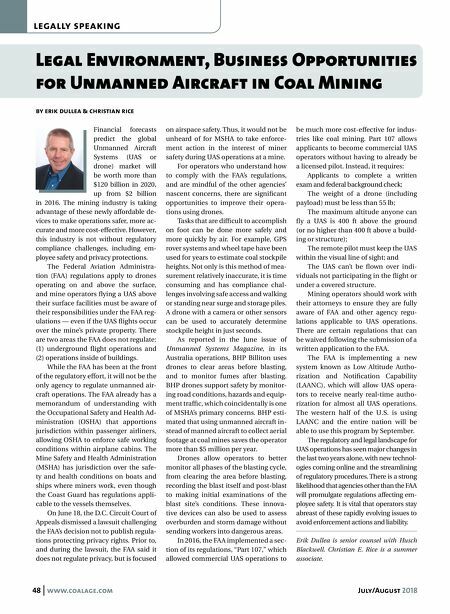 Thus, it would not be unheard of for MSHA to take enforce- ment action in the interest of miner safety during UAS operations at a mine. For operators who understand how to comply with the FAA's regulations, and are mindful of the other agencies' nascent concerns, there are significant opportunities to improve their opera- tions using drones. Tasks that are difficult to accomplish on foot can be done more safely and more quickly by air. For example, GPS rover systems and wheel tape have been used for years to estimate coal stockpile heights. Not only is this method of mea- surement relatively inaccurate, it is time consuming and has compliance chal- lenges involving safe access and walking or standing near surge and storage piles. A drone with a camera or other sensors can be used to accurately determine stockpile height in just seconds. As reported in the June issue of Unmanned Systems Magazine, in its Australia operations, BHP Billiton uses drones to clear areas before blasting, and to monitor fumes after blasting. BHP drones support safety by monitor- ing road conditions, hazards and equip- ment traffic, which coincidentally is one of MSHA's primary concerns. BHP esti- mated that using unmanned aircraft in- stead of manned aircraft to collect aerial footage at coal mines saves the operator more than $5 million per year. Drones allow operators to better monitor all phases of the blasting cycle, from clearing the area before blasting, recording the blast itself and post-blast to making initial examinations of the blast site's conditions. These innova- tive devices can also be used to assess overburden and storm damage without sending workers into dangerous areas. In 2016, the FAA implemented a sec- tion of its regulations, "Part 107," which allowed commercial UAS operations to be much more cost-effective for indus- tries like coal mining. Part 107 allows applicants to become commercial UAS operators without having to already be a licensed pilot. Instead, it requires: Applicants to complete a written exam and federal background check; The weight of a drone (including payload) must be less than 55 lb; The maximum altitude anyone can fly a UAS is 400 ft above the ground (or no higher than 400 ft above a build- ing or structure); The remote pilot must keep the UAS within the visual line of sight; and The UAS can't be flown over indi- viduals not participating in the flight or under a covered structure. Mining operators should work with their attorneys to ensure they are fully aware of FAA and other agency regu- lations applicable to UAS operations. There are certain regulations that can be waived following the submission of a written application to the FAA. The FAA is implementing a new system known as Low Altitude Autho- rization and Notification Capability (LAANC), which will allow UAS opera- tors to receive nearly real-time autho- rization for almost all UAS operations. The western half of the U.S. is using LAANC and the entire nation will be able to use this program by September. The regulatory and legal landscape for UAS operations has seen major changes in the last two years alone, with new technol- ogies coming online and the streamlining of regulatory procedures. There is a strong likelihood that agencies other than the FAA will promulgate regulations affecting em- ployee safety. It is vital that operators stay abreast of these rapidly evolving issues to avoid enforcement actions and liability. Erik Dullea is senior counsel with Husch Blackwell. Christian E. Rice is a summer associate.